Buy Your Way: Did you know you can complete the purchasing process (even financing!) from the comfort of your home? No need to change out of those sweatpants! Price Match Guarantee: We want you to be confident knowing you got the absolute best price in the market. Simple as that. 48-hour Exchange Policy: Take your new car home and drive it for a couple days. Truly get the feel for the car to make sure it’s the right fit for you. We never want you to have buyer’s remorse, which is why you can return the car within 48 hours of purchasing if you two just don’t get along. 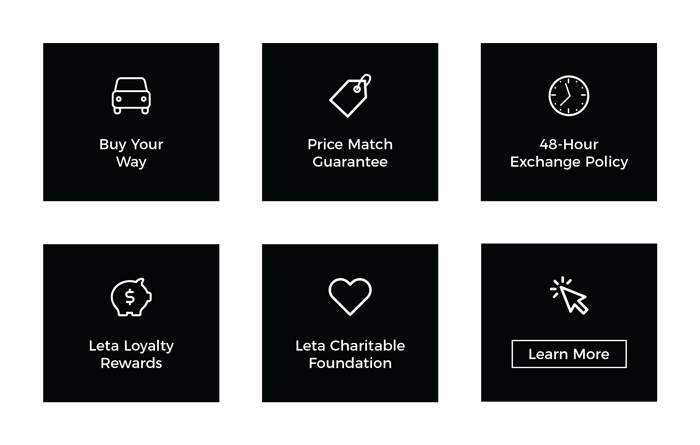 Leta Loyalty Rewards: Who doesn’t love being rewarded? Free car washes for life? Check. Loaner vehicles? Check. Pick up and delivery service? Double check! Frank Leta Charitable Foundation: The part we’re the most proud of. We would be nothing without our community, so we’ve made it our mission to give back by providing safe and reliable transportation to those in need in this beautiful city we call home. So, did you skip over most of this post because it was too much to read? No blog shaming here, my friend. If videos are more your style, watch this fun animation we created below!